3 nights, 2 days, probably the perfect amount of time for us to spend in what can only be described as the hub of continental Asia. As it was technically the start of our honeymoon we lashed out and stayed at The Marina Bay Sands, I’d heard so much about it and it lived up to expectations. I mean it’s not just a hotel but an entire complex which overlooks Marina Bay and the gardens. Hotel, restaurants, cafes, shopping mall, casino, exhibition centre, it’s all there. And yes the million dollar infinity pool shot was taken, but I preferred admiring all those trying to get the perfect photo, there are photographers employed by the hotel who swim around a take your photo a bit like a theme park ride. Oh, and the wind, no one tells you about that. But let’s get to the food. Me and my hubby both love Asia, and living in the UK it’s not somewhere (like Europe) you can get to quickly and cheaply, so when we are there we try to experience as much as possible. Saying that, we arrived early evening on our first night after an eight hour flight from Melbourne, so got room service and planned the next two days adventures. 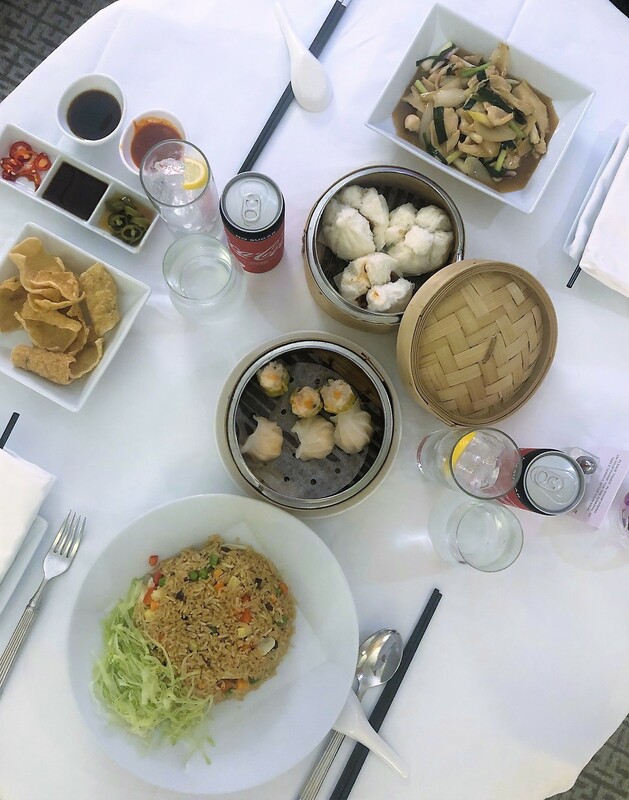 Fried rice, mixed dumplings, ginger chicken and two coke zeros – such rock and rollers we are! 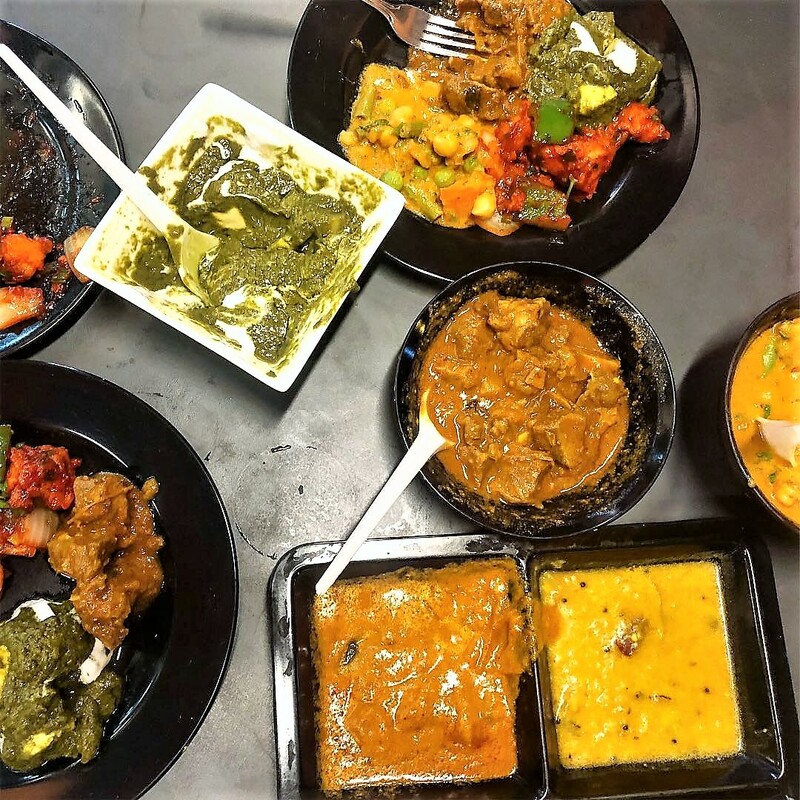 Singaporean cuisine is a mix of many different cultures so there is plenty of choice. Breakfast was included at Marina Bay Sands, with three restaurants to choose from we started at Rise, aptly named since it opened at 630am and we were there shortly after. Literally everything you can imagine. Eggs, omelettes, fruit, pastries, toast, noodles, soups, dim sum, juices, cereal, yoghurts, coffee, fish, cheese, continental meats I could have sat there all day and continued to eat. But I didn’t. My tactic at these kinds of buffets is to get very small amount of everything I feel like so I don’t feel too full but satisfy the fact I want to try it all! I know noodles at breakfast might seem weird, but not for me. In fact, on the plane to Singapore we both said “now we get to have noodles and rice for breakfast”. Cringe but true. We planned to skip lunch as we weren’t hungry, until we stumbled across China Town. Food stalls everywhere, as well as jewellery, beauty and travel agents. The food stalls are filled with lots of variety. Bao buns and dumplings as far as the eye can see. Pigs heads, intestines and trotters also on display, which for many of us may seem slightly odd, but it’s great this culture eats the entire animal, something we in the western world should do more of. We throw too much away. Food standards are pretty much non existent but just embrace it, use your head and your gut that’s what its there for, common sense. 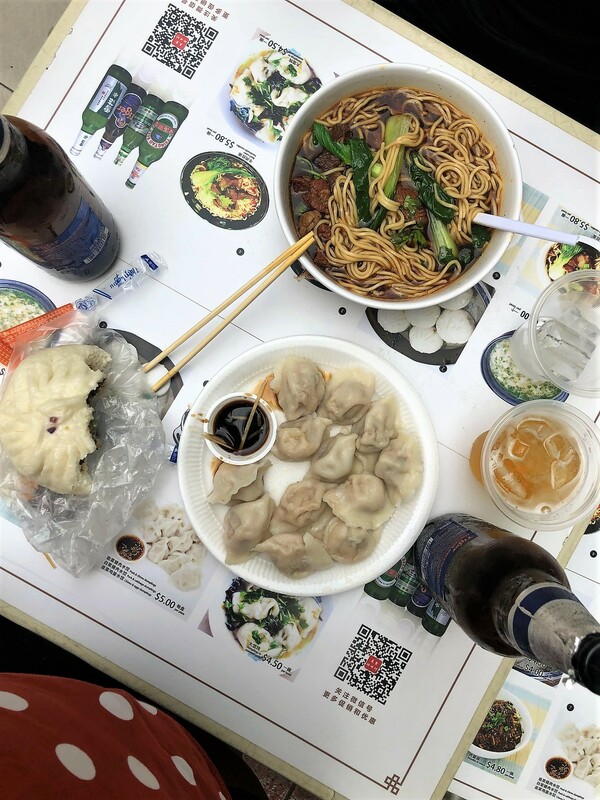 For lunch we dined on dim sums, a pork and chive bao and beef noodle soup accompanied by two Tiger beers. My sister in laws friend lived in Singapore for a few years so we had some hot tips from her so headed to Lau pa Sat that evening. 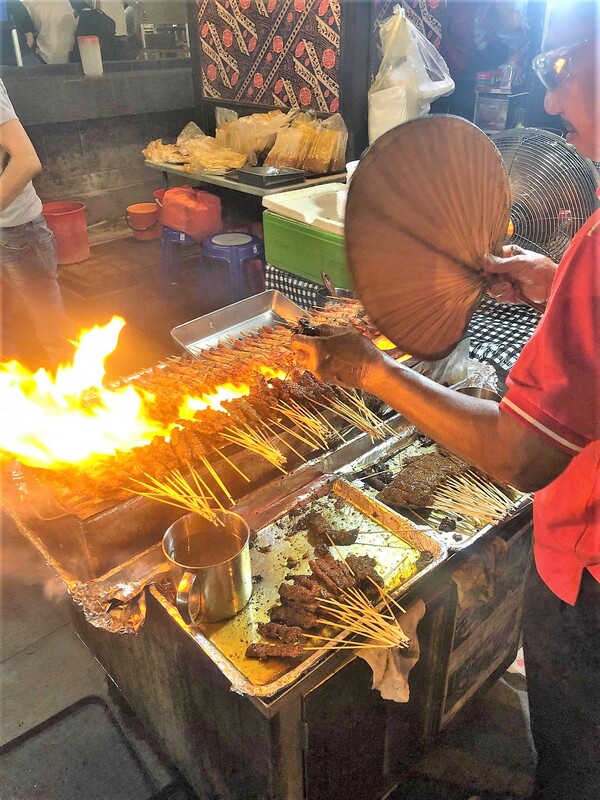 A food market in downtown Singapore with an entire street dedicated to satay. All the stalls are in a line and numbered, you just sit outside the one you like best, they bring you a menu and you order. The beer is poured by the Tiger ladies, they come around and you pay them separately. 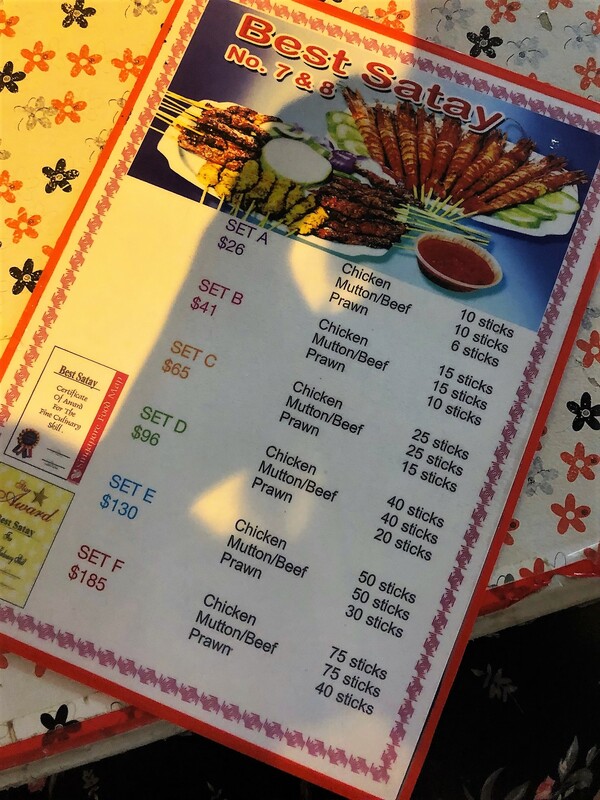 We just went for the basic satay package, chicken, mutton and prawns. Basic but so flavoursome, the prawns are whole so get ready to peel. Useful tip, they don’t give you napkins, but there are ladies walking around and selling them, clever! Be prepared to leave with your clothes smelling of the wonderful barbecues which go all night. It’s totally worth it. 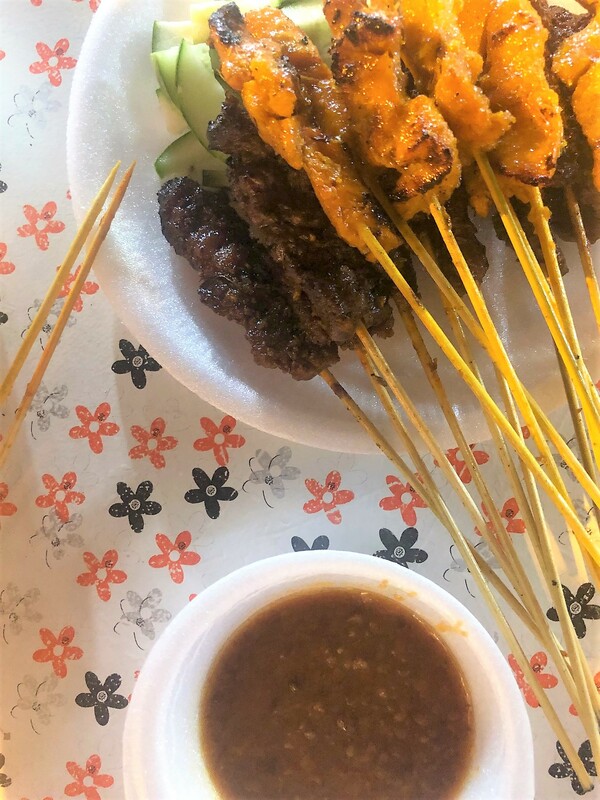 And number 7 & 8 are the best satay – and that’s also the name of their stall. Breakfast at Adrift, similar to the day before but a little more, posh shall we say. We again opted for noodles, and an omelette and I also had a poached egg with smoked salmon on half an English muffin. Fruit consumption at breakfast has almost been a daily occurrence and today I tried longans just like lychees with some dragon fruit and watermelon. Eat the rainbow, done. Lunch was a shared banh mi by the pool, hotel food. Mediocre but better than we both thought. Our final night we visited Little India. The Tekka Centre there is the food market and we would have eaten here except for the fact we walked into the raw meat and fish entrance and it turned us both off, we just couldn’t get past it. Not to worry though we took a short walk stopped for a beer and discussed our options. We ended up at RW Selmor. Good choice. We started with veggie samosas, I also had a masala tea as the locals were drinking it and I wanted to sample the sweet goodness. We then ordered a plethora of different things, both agreeing the mixed veg curry as the winner. The mutton came in a close second and the cheese prata which came with accompanying dhal was tasty too. That being said, the dishes came out with plastic spoons and it just made me sad. The fact is that whilst we in the UK are doing so much on the single use plastic front, this part of the world isn’t there yet. Tips for eating on the street: get it out of your head you’ll get sick. Choose places that are busy, that also have locals there too. The level of cleanliness is never going to be what you are used to so don’t compare it. We also took before and during our trip a probiotic, whether or not that helped I don’t know but emerging research suggests it can help. Boots do a pack of 30 for £8.99, do yourself a favour and get some. Gardens by the Bay – you can pay to enter the conservatories but even just wandering round the gardens themselves is truly beautiful. 1Altitude Bar for the view only. It’s the tallest bar in the world, and FYI it’s free entry for women on Wednesdays which as the day we went! The amenities and drinks leave a bit to be desired. Sentosa is Singapore’s theme park on its own island, aimed at families you can climb to the top of the Merlion and walk to the southernmost point of continental Asia. Get the cable car over and then if you get the monorail back you don’t have to pay. Well I think you are supposed to, but we just sneaked out! The cable car also goes over to Mount Faber Park which is lovely to walk around. Marina Bay Sands – if you aren’t staying there then still visit, and go to the top for a drink. Only guests can swim. Hawker food centres are great if you are into food, find one and just wander round. 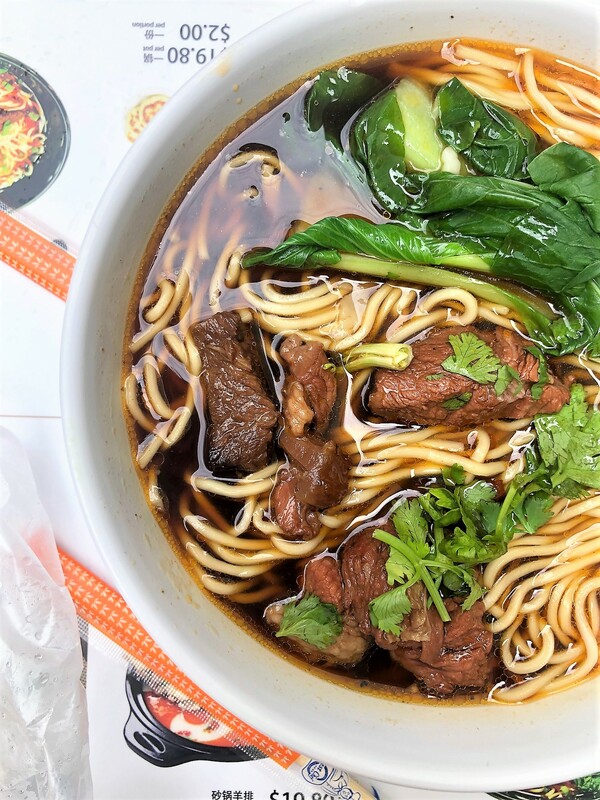 You’ll get bowls of noodles for a couple of quid. Have a Singapore Sling at Raffles, it was closed for refurb when we were there so I ended up having mine in Malaysia so no recommendations there. Also be prepared for just how many oil tankers there are on the sea and horizon and the humidity to hit you like a brick. Permanent sweaty clothes.